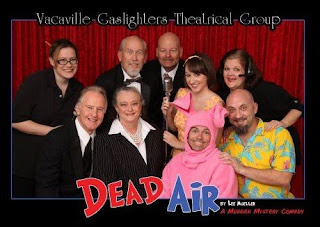 My friends out in California, Vacaville Gaslighters are presenting one of my older favorite scripts called "Dead Air" which at the time I wrote the play was a homage to the AM radio stations I heard around the St. Louis area. The type of station that was frozen in another decade. Not necessarily an "oldies" station, no I'm referring to a station whose heyday had blinked from relevance a long time ago but due to just enough market share, still plugs along. The music selection bordered on elevator music and the call-in-talk-show segments were nothing more than complaint rants from lonely grumpy people looking for cathartic relief. "Dead Air" visits one such station on a live anniversary broadcast where the host has a melt down and the Bunny Bagel Boy is poisoned. "Dead Air" runs the weekend of February 22-24 and March 1-3.
by Caricatture productions in Chennai, Tamil Nadu at the Music Academy Mini Hall on March 3rd at 3;30pm and 7:30pm This will be the 2nd time this play has played in India. Must be good Karma.